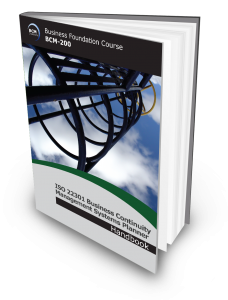 BCM Institute’s introductory 1-day foundation course on the fundamentals of the international ISO22301 standard for BCMS and Business Continuity Management (BCM) provide the participant with grounding in the ISO22301 of BCM best practices released in May 2012. The course prepares the participants with the framework and guidelines for companies, large or small, to move to a higher level of preparedness to lessen the impact of natural or man-made disruptions. BCM Institute used experiential training by experienced instructors who expound the BCM’s best practices, via classroom exercises and instructor-led discussions. The course is currently only available in Singapore, Malaysia, Thailand, Indonesia and Philippines. Fundings are only available for Malaysians via HRDF. For further queries feel free to contact sales.ap@bcm-institute.org. The Business Continuity Certified Planner (BCCP) Certification is awarded to participants who successfully completed and passed the Qualifying BCCP examination attached to the course. This certificate is renewable annually at SGD50. Understand the function and purpose of ISO22301 Business Continuity Management (BCM) standard for BCMS. Translate the requirements of ISO22301 and its applicability to your organization business functions. Articulate key BCM concepts and terms to your management, business partners, suppliers and/or colleagues. Walkthrough each phase of the BCM planning methodology. Understand the implementation of the Business Continuity Management System (BCMS) in accordance to ISO22301 or relevant BCM standard. Senior management with BCM responsibilities who requires a more comprehensive understanding of BCM. Anyone new to the BCM and/or ISO22301 and is required to have a good understanding of the BCM Programme. If you have been tasked to spearhead or assist in the ISO22301 implementation initiatives within your organization. If you are a business partner or service provider of essential services to any organization of which the disruption of such a service provided by you would be of catastrophic consequences to that organization. This course incorporates a 50-Multiple Choice Question electronic exam the next day. The duration of examination is 1 and 1/2 hour. Candidates who achieve with a passing score of 75% or higher are eligible to apply for the BCM Institute’s Business Continuity Certified Planner (BCCP)accreditation. The examination fee is included as part of the course fee. This course fee includes the BCCP examination fee. BCM-330: ISO 22301 Implementing the BCMS or BCM-5000, DRP-300 or DRP-5000. For a novice who is keen to gain a comprehensive understanding of BCM, it would be useful to attend the BCM-5000: ISO 22301 Expert Implementer for BCMS course. A candidate that does not have the necessary BCM experience to meet the BC Certified Expert (BCCE) certification and have passed the BCCE examination, will be allowed to apply for the BC Certified Planner or BC Certified Specialist.